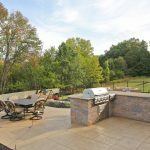 The Patel’s were in the process of completely renovating their entire outdoor living space and needed a plan. 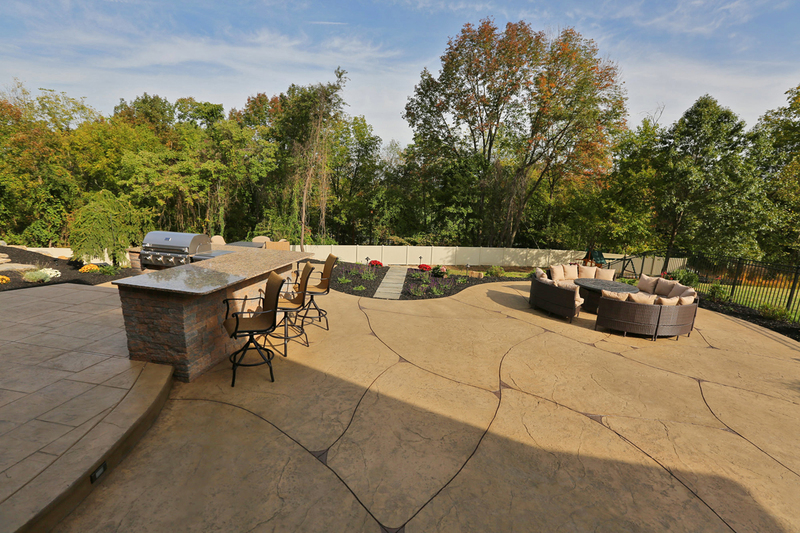 After seeing the outdoor living area that Signature Concrete Design had created and installed for a friend, they asked us to create a space similar in layout and style. 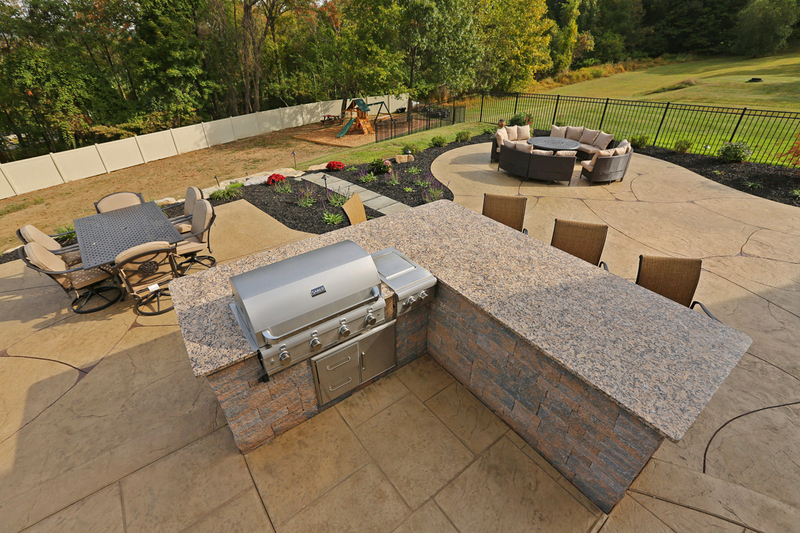 Their backyard was different from their friend’s – lying on tiered plateaus – which meant they would need another layout. They also had a property with overgrown plants which they had tried to maintain and remove, but the project became too big and too overwhelming for them with their busy schedules. They asked us for a complete solution – for both the front of their home and the back. The Patel’s knew exactly what they wanted. 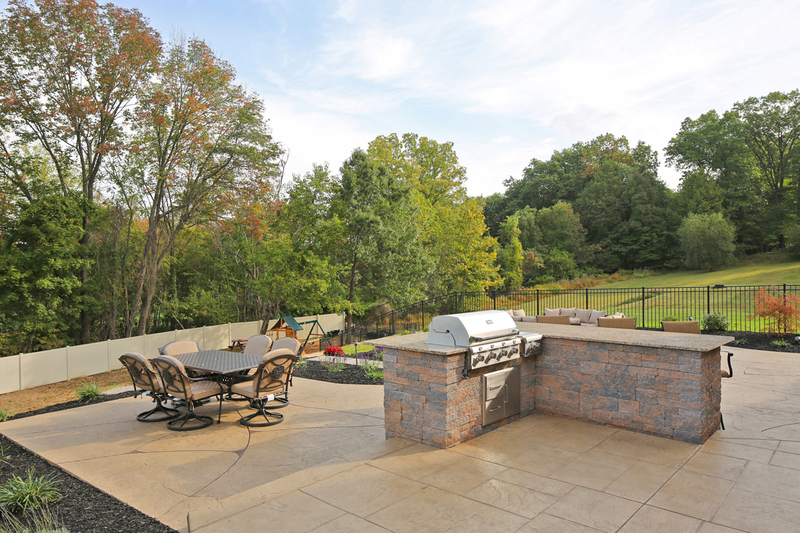 When we met with them to evaluate the site, we discussed their needs and future plans for their outdoor living space. Their back yard already consisted of tiered plateaus and they had long-term plans for each tier. They also wanted to add low maintenance curb appeal to the neglected front lawn area and their home’s main entrance. The Patel’s asked that we use certain plants and exclude others. 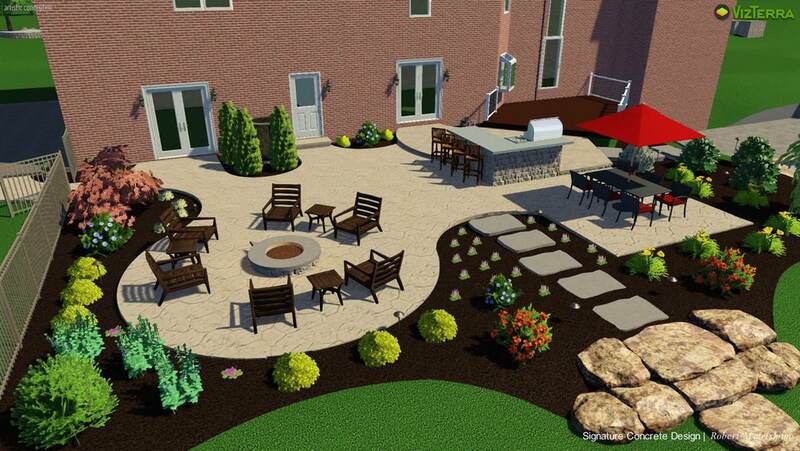 Our outdoor living space project was the centerpiece for their three phase plan which will include a deck and a pool. 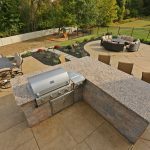 They needed entertaining areas that allow for large get-togethers, an outdoor kitchen and bar area, space for a fire pit and a dining area. 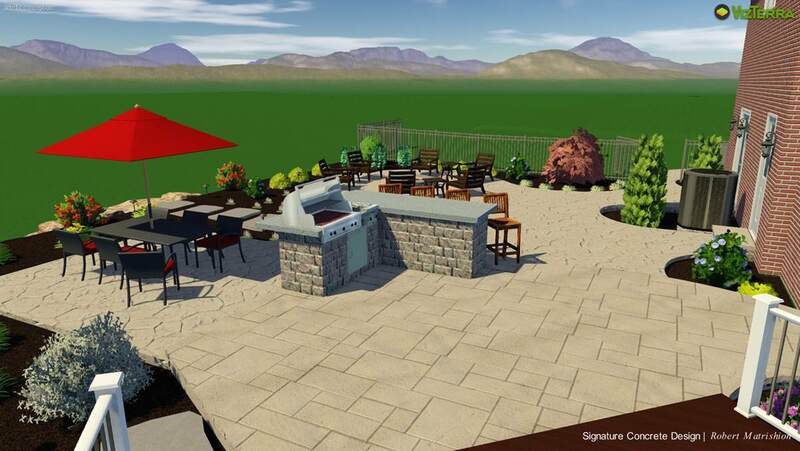 The Patel’s had a wish list of appliances for their outdoor kitchen. They also wanted to add landscape lighting and plant color to accent the hardscaping project. Our design mimicked one the Patel’s had already seen and loved. We adapted it to suit their property and their needs. 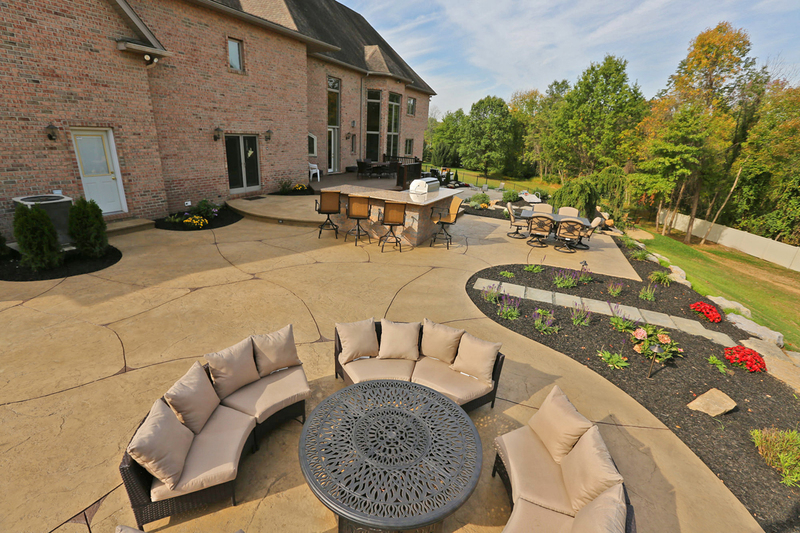 We designed the patio to answer the Patel’s future needs – including entrances to pool areas, play areas and walkway to their driveway. Our focus was the main plateau. We designed three distinct rooms, including a kitchen/bar area, a fire pit area and a dining/entertaining area. Each room was carefully constructed to allow for comfortable entrance and exit points into the remaining areas of the outdoor space. 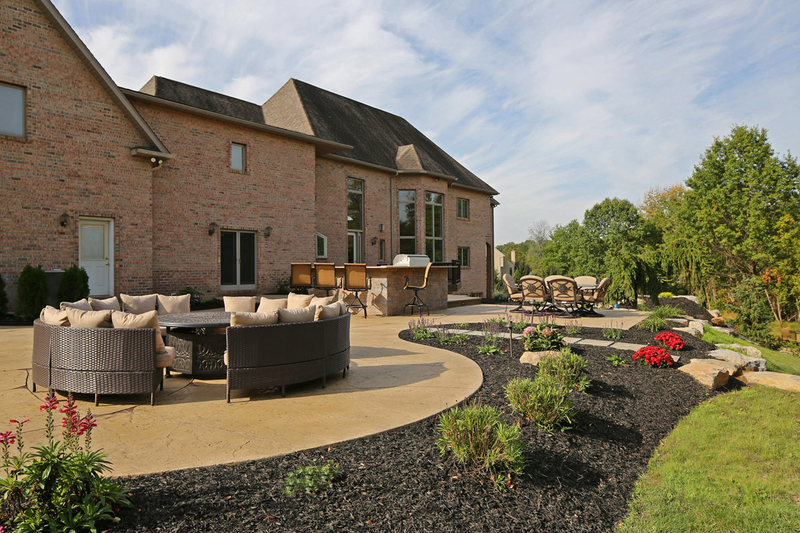 Using a combination of curves and angles to the home, we maximized the space available on the top tier of their yard. 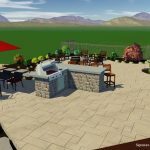 We created an outdoor kitchen complete with their dream appliances and extended an L-shaped bar area to allow for more seating space. The result? 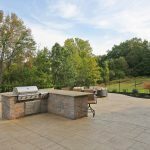 A beautiful 1,700 square foot two-tier decorative stamped concrete patio with two different patterns and textures imprinted in the concrete. 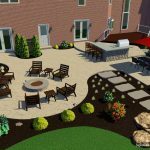 We finished the design with landscape plantings to add year-round color, and landscape lighting in the plantings to add drama. Hardscape lights were installed in the bar area, step risers and the landscape to extend their entertaining late into the night. We designed a low maintenance front yard landscaping plan that provided all-season interest while staying within budget. Our multi-bed planting plan took into account the placement of deciduous trees and awkward sun/shade positioning. We included an abundance of long-lasting perennial color and a symmetrical layout along with a combination of many different plants. Our design incorporated evergreen shrubs and groundcover, spring flowering shrubs as well as shrubs and trees which provide wintertime interest. To create harmony and balance throughout the entire property, we used similar plants in the outdoor living area landscaping. 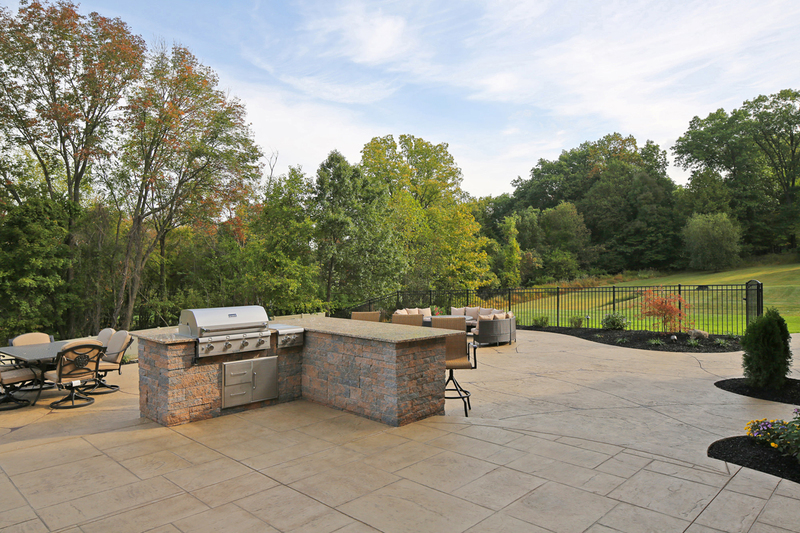 THE STAMPED CONCRETE PATTERN: Top Tier: Large Slate; Bottom Tier: Fractured Earth texture with custom designed saw cuts with coloring. 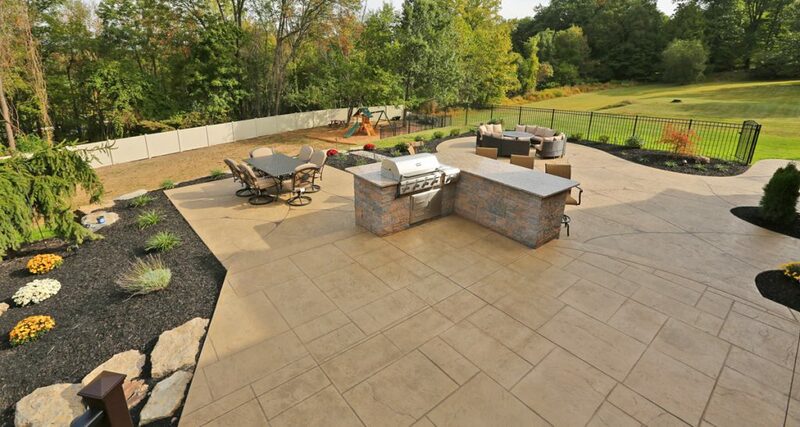 THE STAMPED CONCRETE COLOR COMBINATION: Stedman Buff Color Hardener with a Walnut Release. Integral color also added.